Description:Mini Roses, Mini Carnations and baby's breath in a beautiful Kiss Ball with a ribbon. Colours can be changed. Aprox. 12 cm in diameter. Wedding Flowers and Wedding Rentals in Vancouver, BC. 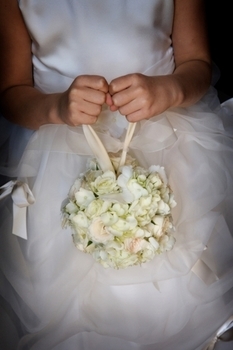 We provide exquisite Wedding Floral Design, Decor and Rentals for any budget and style. We serve the area of Vancouver and the lower mainland.